The key to having a successful business is to have the right tools, and for people that are in the audio and visual rental business, particularly for events, parties and weddings, having the right tools can mean the difference between having a successful business and that business ultimately failing. For the audio-visual industry, there is a valuable tool that can offer a mobile solution known as Equip Calendar. With Equip Calendar, people who make a living by providing music and entertainment for special events can benefit in ways that will improve their business and help them make more money. For people who provide music for events such as graduation parties, birthdays, and other special occasions often find themselves in need of a little help to keep their business organized. With Equip Calendar, every single party can be entered into one convenient calendar easily available on every user’s favorite gadget – smart phones and tablets. Just one touch and a user can get instant access to all of its functions, which will help them be on time for their commitments and have the right equipment required for a particular event. In addition to having a calendar with all the parties scheduled, Equip Calendar can also make sure that the events and parties take place in an orderly fashion. The software guides you through your gig’s schedule – it tells you when to arrive, when to set up, when the event itself starts, and what happens afterwards. With the Equip Calendar software, the whole night will run smoothly because the user will be able to keep track of all of the tasks and duties. Equip Calendar makes every gig a pleasant experience. There is no business and no real entrepreneur without tools that allow them to schedule inventory, gain customers and make money. People working in the audio-visual rental industry can hardly be well-organized and expect profit if they cannot keep track of their schedule, which needs to be in perfect order, as well as each of their gigs. Equip Calendar is a mobile solution, and those in the lighting and audiovisual industry are becoming increasingly fond of the software since it has proven to be very useful in running their businesses. 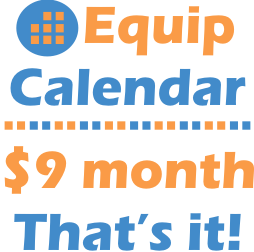 Thanks to Equip Calendar, the basic resources – the calendar and equipment is readily at hand– anyplace and anytime.